The CD11b antigen is also known as the integrin αM subunit. It combines with the CD18 antigen (integrin β2 subunit) to build the integrin Mac-1 (CD11b/CD18, αMβ2, CR3, iC3bR, Mo-1). CD11b is a type I transmembrane glycoprotein of 170 or 165 kDa under reducing or non-reducing conditions, respectively. CD11b shows 19 potential N-glycosylation sites. Expression of the CD11b chain on the cell surface requires the presence of the CD18 antigen (also known as β2 integrin chain). Together, these two subunits create the CD11b/CD18 integrin, one of the four integrin heterodimers that can be built by the association of CD18 β chain with four distinctive CD11 α chains. 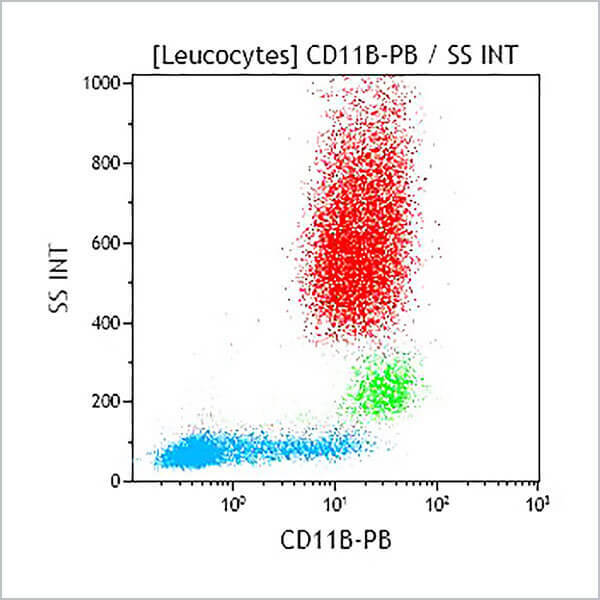 CD11b/CD18 is highly expressed on NK Cells, neutrophils, monocytes and macrophages. *Alexa Fluor and Pacific Blue are registered trademarks of Molecular Probes, Inc.